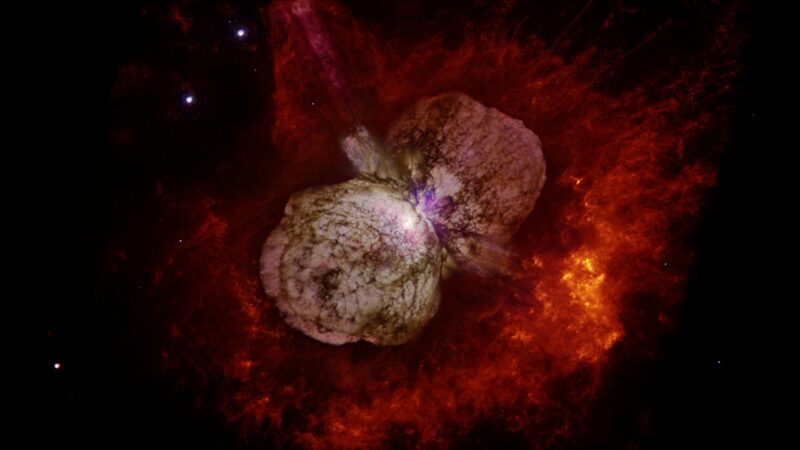 Fixed star Foramen, Eta Carinae, is actually a stellar system containing at least two stars in Carina, The Keel of the Ship, Argo Constellation. Foramen is five million times brighter that of the Sun. Between 1837 to 1856, it brightened in an event known as the Great Eruption. The stars of Foramen are now obscured by the remnants of the Great Eruption, the Keyhole, or Homunculus Nebula. Jupiter conjunct Saturn conjunct Foramen: Separately, the two planets would affect only occasionally and there would be no disease connected with this. The combination, however, brings on an extreme malfunction of the entire kidney system. There is a blockage of energy here that travels up through the spine and as far as the eyes. Some persons would have the expansion of the Jupiter energy, and others would experience the Saturn energy depending on the orbiting aspects of the planets. If the Saturn energy is affected adversely, the native would experience a restriction of light to the eyes. If the Jupiter energy is adversely affected, there is too much light to the eyes. Both would cause headaches – with Saturn, tiny sharp sensations, and with Jupiter, very sudden headaches. Uranus, Saturn and Mercury orbiting this point would affect the Saturn energy, and the Sun and Venus would affect the Jupiter energy. 1. 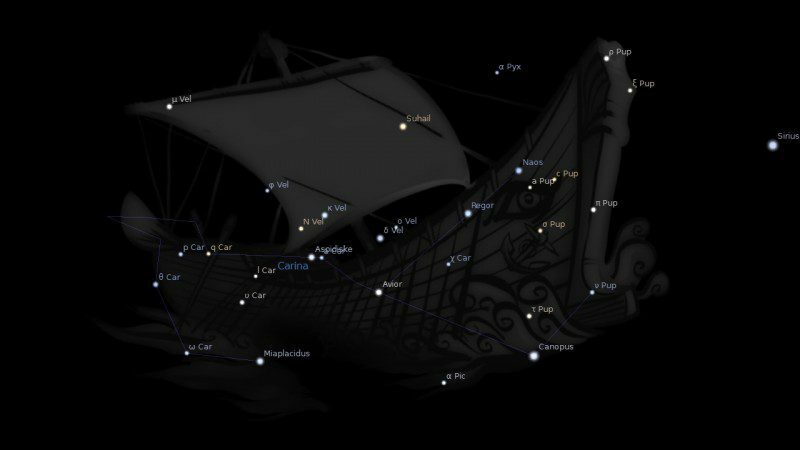 Fixed Stars and Constellations in Astrology, Vivian E. Robson, 1923, p.30, 167. 2. The Living Stars, Dr Eric Morse, 1988, p.162. 3. The Fixed Stars Health and Behavior Imbalance, Ted George and Barbara Parker, p.83. 4. Fixed Stars and Judicial Astrology, George Noonan, 1990, p.67. My ASC is @ 21.34 LIB. There are no conjunctive planets to this point, but the Moon and Jupiter are conjunct and from a wide opposition from Aries, and Chiron and Mercury trine from Gemini. I have always wondered if I should consider Formen or Spica the stronger influence to this point (I think Spica is just within orb here) and generally how one would combine fixed star interpretations when planets or points are within orb of more than one. Thank you! Glad you found that table useful Leigh. I think you are right about an influence from Spica rising in your chart. Very fortunate! I have it conjunct my Mercury and Venus, but opposite Saturn it takes some time to develop the goodies. Hi Jamie! That “If the Saturn energy is affected adversely, the native would experience a restriction of light to the eyes.” interesting. I had a sudden eye infection at the beginning of 2014 which took months to heal and I light was hurting. I never had that before. If I recall well at that time I had Saturn going over the IC ….could that transit trigger the effects of the star? Yes it could I suppose. I always include the cardinal points for fixed stars. You can learn a lot by not forgetting to include IC and DC. Hi Jamie, my Mars is conjunct this star (in my 10th house). What is your take on that, being the only personal planet not indicated in the description!! Thanks very much. I found President Eisenhowers Sun in Libra was conjunct Foramen, which connotes another connection with DDay as this star was considered to be connected with the ship Argo. This was another connection with the mass invasion on the Atlantic on DDay with ships and planes headed for Normandy. A stretch perhaps but I found leadership ability connected with this star which is probably Eike’s best personality trait.